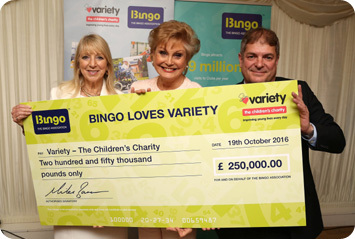 Variety supporter Angela Rippon OBE joined Miles Baron, Chief Executive of The Bingo Association, at a parliamentary reception held by the Association to celebrate its relationship and hugely successful fundraising for Variety, the children's charity and 30 years of the National Bingo Game. The reception was attended by bingo players and charity champions from across the UK who were joined at the event by a number of MPs. This year the hard work and efforts of clubs and bingo players from across the industry and around the country has resulted in over £250,000 being raised for Variety. This brings the figure raised by bingo to over to in excess of £500,000! Angela Rippon said: "I'm very proud to represent Variety today and to take this opportunity to thank bingo players and staff at clubs nationwide for their incredible support. It is only with this fundraising and support that Variety can continue to help young people so that they may reach their full potential"
Angela Rippon has been a familiar face and voice in British broadcasting for over 40 years, winning multiple awards for her work on both televisions and radio. She remains committed to Variety, the children's chary, which she has supported since the 1970s. 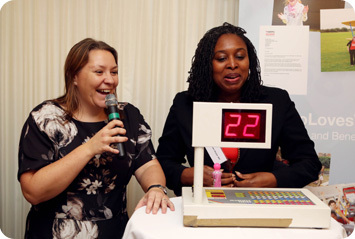 In addition to the cheque presentation and speeches by Chair of the All Party Parliamentary Group on Bingo, Anna Turley MP, the event also involved a charity bingo game, called by Anna and fellow MP Dawn Butler. The game raised a further £200 pound for Variety.